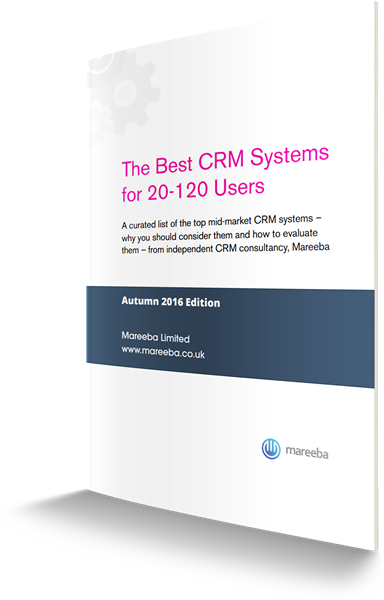 The first thing that tends to strike you about the CRM software market is the sheer range of options. Often the second is the lack of objective, unbiased advice to help you make the right choice. Working at the front-line of the CRM industry for over twelve years, we’re all too familiar with the time and money that can be wasted evaluating, or, worse still, buying and implementing, software that ultimately doesn’t prove to meet the need. The mid-market - which we’ve defined for the purposes of this report as between 20 and 120 users -can be a particularly challenging area. It demands a depth and breadth of functionality, as well as the adaptability to support a wide range of operational needs. At the same time buyers are often more constrained by budgetary considerations than their larger brethren. Which was why we wrote this product guide. We wanted to use the knowledge we’ve accumulated over the last decade or so as independent CRM consultants, to help organisations home in more quickly on the CRM technologies, which, in our opinion, warrant their consideration when considering new CRM software – a curated short-list if you like. For each CRM software package we set out the key facts including pricing and where you can access evaluation software. We’ve also profiled each one, setting out their key strengths and when to consider them. Finally in the last section, we’ve set out some of the factors that you might want to bear in mind when reaching your final decision. For our take on the best mid-market CRM tools out there, just fill out your contact details and we will send it straight across.